Published on June 29, 2008 in Beer Culture and Other Beers. 1 Comment Tags: festival, NAOBF, organic. 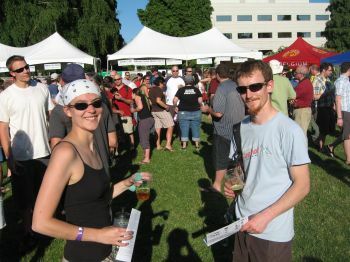 Joe, Linds and I headed down to this years North American Organic Brewers Festival on Friday night to sip some brews, enjoy the summer, and meet up with some of my coworkers. We tried several beers among the masses until Erin and Jade arrived, and helped locate Alan and his neighbors. Alan had been hanging out by the food at the Brewers festival, and I was a little incredulous until I realized that the reason was for shade. I’ve probably said it before, but I think this festival is my favorite simply for the atmosphere. OBF is incredible, but size, mood, and venue for the organic festival is more to my taste. Elliot Bay – Old Burien 600 Malt Liquor. I love a good malt liquor, and this was nearly as good as Walking Man’s Street Walker. Crannog – Hell’s Kitchen Potato Ale. I’d be scared to brew with messy, messy potato startch, but this was a rather nice ale that seemed like a brown. Maybe not the best for 90F, but good. Laurelwood’s Green Mammoth. Had it before, but really liked it again. The other IPAs I had (most were already gone) didn’t have the right body/bitter ratio. To be honest, the only other IPAs I had were Nelson’s and the Yerba Mate one. I really didn’t have that many different beers this time around. I think I had 8 tickets, and ended up getting the malt liquor 3 times (It was really good). The only one I didn’t really like was the Yerba Mate IPA. Many of the beers I’d had before (at Sasquatch, etc) or the lines were just absurdly long (Hub, Hair of the Dog). Luckily, Joe and I found Hub’s IPA on cask at Pause afterward.